“Halftime Report” trader Pete Najarian spots heavy trading in Pandora. Pandora has soared more than 100% so far this year, and investors are betting that run continues. On Thursday traders bought more than 12,000 calls with a September 10.50 strike price, according to Investitute.com co-founder Pete Najarian. It's been a rocky ride for the music-streaming service as competition in the space heats up. Spotify, Amazon, and Apple are just some of the big names that have their own platforms. 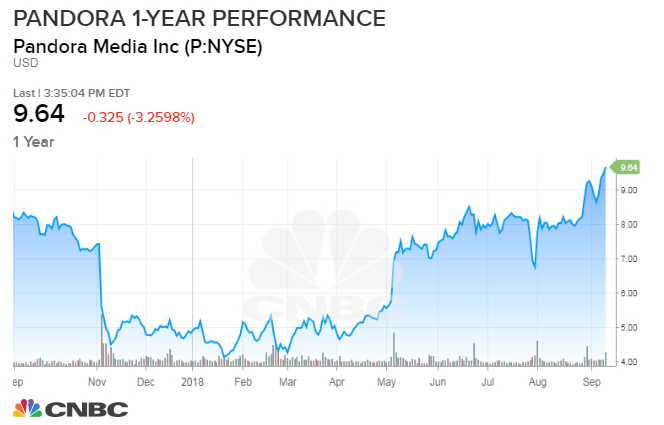 Pandora fell more than sixty percent last year as traders debated the cost of competition and if the service could grow its subscriber base. But 2018 has largely been a different story. The company most recently reported a smaller-than-expected EPS loss for Q2, and revenue that beat expectations. Additionally, Pandora announced it now has around six million Premium subscribers. The stock has gained nearly nine percent since that report on July 31 after-the-bell. These particular calls that Najarian is watching expire on September 28, so it's a relatively short-term bet. Pandora closed at $9.97 on Thursday, which means traders are betting it pops at least 5.3% by the end of the month. Traders can use call options to capitalize on a stock's move higher while simultaneously limiting their downside risk. If Pandora doesn't hit $10.50 by September 28 the traders will only lose the price they paid for the call option - typically a fraction of what it would cost to buy the stock - plus the commission fee. On the flip side, should Pandora blow through $10.50, the call-option gives the trader the right to buy the stock at $10.50 instead of the higher level. Pete Najarian owns Pandora calls.